Besides sharing beautiful images, the impetus for creating Verdance was to use materials that would otherwise end up in the landfill. "Verdant" means lush and green, which is how Alyssum hopes she will leave the world for future generations. She is consumed by the dance world, too...hence the natural combination of the words verdant + dance to create verdance. 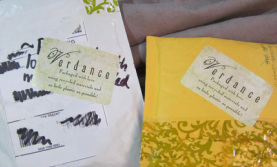 Verdance creations started out referring solely to Alyssum Pohl's double sided pendants, but has expanded to include greeting cards of her collage designs, other bits of jewelry, and more. I choose the images for my pendants with care—each image in a pairing is meant either to complement or echo the other. They speak to me personally, and I hope you find them to reverberate with you as well. Sometimes they show two versions of a similar concept, sometimes they are opposing or seemingly un-alike images to play off the fact that we all have more than one side to our personalities. The pendant can be worn as a necklace on a ribbon, or on a chain; can be added to a charm bracelet; kept as a special memento or good luck charm in your pocket (I can remove the jump ring from any pendant if you like); wrapped around bouquets; made into ornaments; incorporated into costuming, etc. These pendants are made from reclaimed glass windows that were headed for the landfill. Each piece is handmade, and I strive for excellence as I make each one, but imperfections may remain as a vestige of the fact that the pendant was made by hand. Each one is stamped with my initials, then cleaned and polished before being presented to you for sale. There may be tiny paint spatters on the glass from when the windows were painted, but I try to put these imperfections on the outside so that you can scrape them off with a razor if they bother you. I like the rustic, proof-that-the-glass-is-reclaimed nature of such “imperfections”. The smallest side measures 1 inch across, unless otherwise noted, you can estimate the measurement of the other side by comparison. 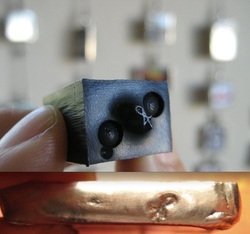 Each pendant is ~¼ inch thick. The images are printed on acid free paper so that the image should not fade with age. The glass is hand-cut, and the solder used is lead-free, jewelry grade solder.